I arrived at the railway station on Saturday morning to find that there was a rail replacement running for the first part of the route. Luckily I have an alternative rail link and arrived at that station just before the train left. Decent connections on the way meant that I arrived at the West Herts half an hour before it was due to open. Needless to say, Don was already there so we had a good chat before the doors opened and were soon sitting at ‘our’ table with a pint (mine) and a cuppa (his). On asking whether hot food was available, we were told that it had been reggae night at The Horns the previous evening, so we were unlikely to see the man in charge of the hot food. That has to be the best excuse I have ever heard, it certainly made me laugh. As always before cup games, we speculated about the team selection. Silva’s statement that he would “respect the competition” indicated that he would put out a strong team and, sure enough, the three changes announced were to bring Cleverley, Pereyra and Deeney in to replace Watson, Richarlison and Gray, so could hardly be seen as weakening the team. It was certainly about time that Richarlison was given a rest. So the starting line-up was Gomes; Janmaat, Wagué, Kabasele, Zeegelaar; Cleverley, Doucouré; Carrillo, Capoue, Pereyra; Deeney. As expected, with a League Cup semi-final coming up next week, City’s manager and former Watford man, Lee Johnson, had made seven changes. The City Twitter account this season has been accompanying their goal alerts with amusing gifs, we wondered how many of the starting XI for this game would have their own gif. Despite all City’s changes, I can’t say I was particularly confident about the outcome, but the game started positively for the Hornets, who had an early chance as a Janmaat cross was met by the head of Deeney at the far post, but the effort was saved by the City keeper, Steele. The next attempt was a shot from distance from Capoue that was straight at Steele. There was a much better chance as a low shot from Janmaat deflected to Pereyra who turned and shot from close range, but Steele was able to make the block. After a decent, if over-lengthy, passing move Cleverley tried a shot from distance that was blocked. From a corner, the ball found its way to Wagué whose volley was also blocked. 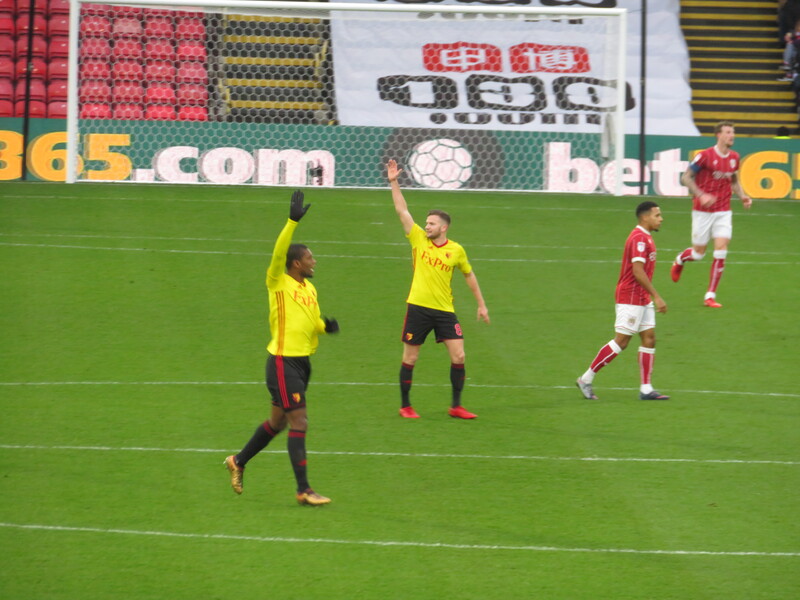 Watford threatened again as Carrillo played a through ball to Cleverley, who broke into the box, but Steele was out to save at his feet. The first yellow card of the game was earned by Kabasele for a foul on Smith. After a lovely passing move upfield, Carrillo played a cross-field pass to Pereyra but, yet again, the shot was blocked. The opening goal came on 37 minutes as Pereyra crossed for Carrillo who got into position to shoot and beat Steele from close range. It was into the last five minutes of the half before City had their first goal attempt of the game which was a shot from distance from Woodrow that flew wide of the far post. So we reached half time with the Hornets enjoying a one goal lead. It had been a half in which Watford had completely dominated possession and appeared in control. But the Swansea game was too fresh in the memory, so I was rather concerned that we hadn’t tested Steele enough. Lee Johnson made a substitution at the beginning of the second half replacing Smith with Pack. The first chance of the second period fell to the Hornets as Pereyra played a one-two with Carrillo before unleashing a shot that cannoned off the post. 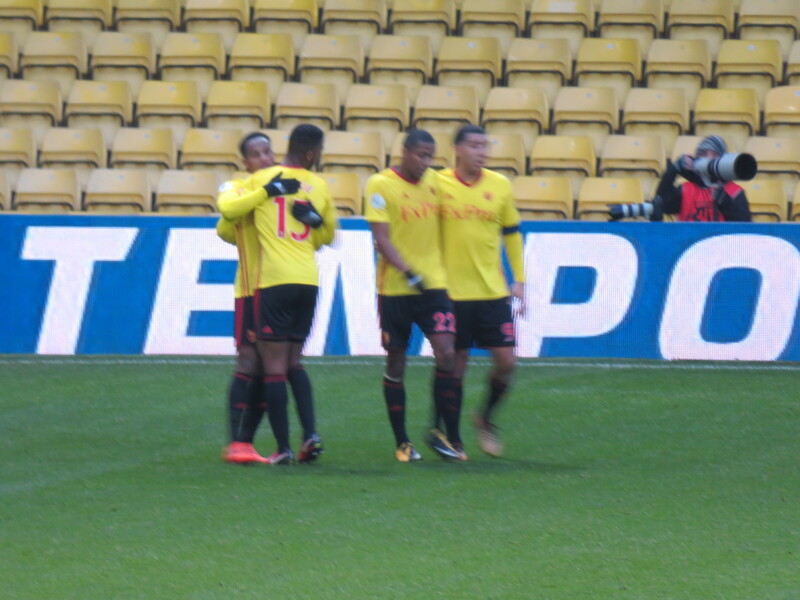 The follow-up from Capoue was blocked by the keeper. The second goal came just before the hour mark as Cleverley reached the by-line and crossed back for Deeney to stoop and head home. 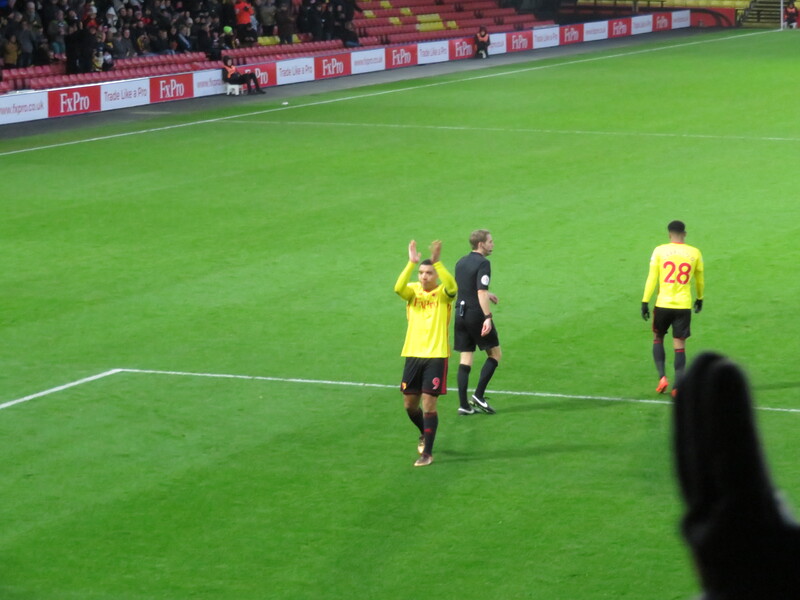 Deeney’s return to the scoresheet was received very well by the Watford faithful and it was a goal that calmed the nerves. City had a great chance to hit back as a dangerous cross from Eliasson was delivered towards Taylor who just missed making contact. That was his last action of the game as he was replaced by Engvall. Watford had a great chance for a third goal as Deeney met a cross from Janmaat, but this time he nodded into the side netting. Silva made two changes with 20 minutes to go as Carrillo and Pereyra were replaced with Holebas and Richarlison. I was a little surprised to see the youngster come on, surely he deserves the rest. But he was soon in action latching on to a ball from Deeney that he volleyed straight at the keeper. The visitors had a great chance to pull one back as a cross from Eliasson was turned just wide by Engvall. There was a great chance for the Hornets to increase their lead as Zeegelaar played the ball back to Holebas who unleashed a cracking shot from distance that Steele did well to turn wide. From the corner, the ball fell to Wagué who volleyed over the bar. Each side then made a substitution as Woodrow was replaced by Hinds and Doucouré made way for Watson. 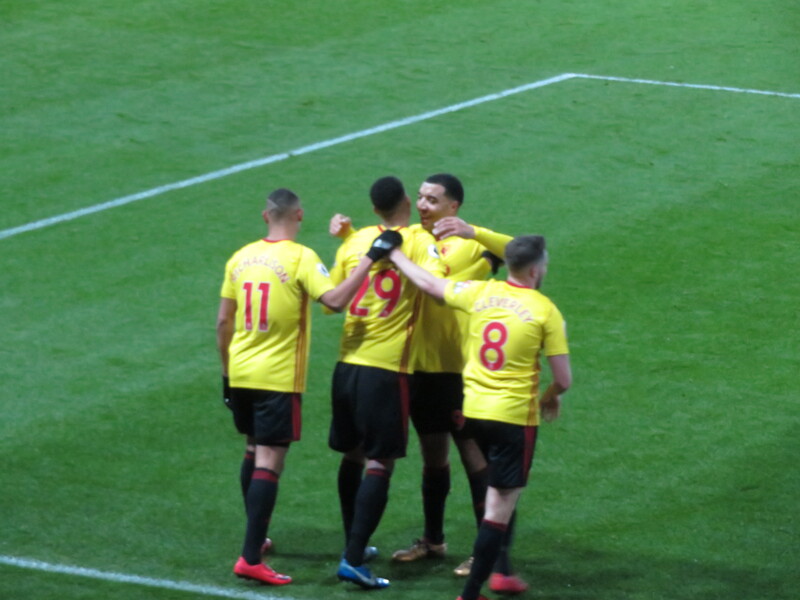 Watford scored a third with five minutes to go as Capoue played a one-two with Deeney before finishing in front of the Rookery. That goal gave particular pleasure to my niece who is a fan of the Frenchman. So the game finished with Watford securing a convincing 3-0 win over City. The Hornets had been in control for the whole game, but the most pleasing thing was that they had bucked the recent trend by scoring the goals that were needed to finish the game off. Deeney’s return had been greeted with mixed reactions on social media, but I thought he played well and provided more of a goal threat than we have seen from him (or anyone else) recently. I also thought that Pereyra looked more comfortable than he has in some time and some of his skills are a joy to witness. So Watford are in the draw for the fourth round on Monday. I am hoping for an away tie at either Newport or Rochdale. I should be so lucky. This entry was posted in Watford FC and tagged Abdoulaye Doucoure, Aden Flint, Andre Carrillo, Ben Watson, Bristol City FC, Cauley Woodrow, Christian Kabasele, Connor Lemonheigh-Evans, Daryl Janmaat, Etienne Capoue, Freddie Hinds, Gustav Engvall, Heurelho Gomes, Hordur Magnusson, Jose Holebas, Korey Smith, Lee Johnson, Lloyd Kelly, Luke Steele, Marco Silva, Marlon Pack, Marvin Zeegelaar, Matty Taylor, Molla Wague, Niclas Eliasson, Opanin Edwards, Richarlison, Roberto Pereyra, Tom Cleverley, Troy Deeney, Watford FC, Zak Vyner on January 7, 2018 by franelynn.